I have redone the site (I wasn’t very pleased with the last incarnation, anyway) and postponed switching servers over. I did manage to switch the domain over. In an effort to feel more productive, I’ve been knitting and crocheting small easy to finish projects, such as that scarf down there. 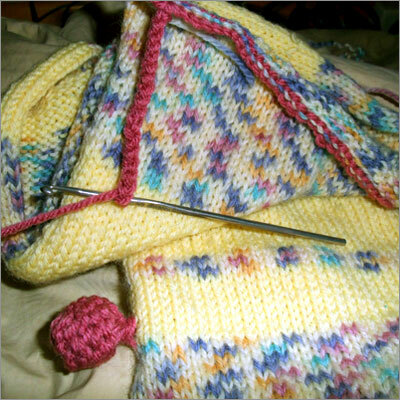 I knitted a small scarf in stockinette knit and am finishing the ends with a crochet and a button hole. I also crocheted knitted buttons for it. I tried to play some piano to the horror of my neighbors and I’ve been cooking. A lot. This is all just to say that the career change front is a little tough. I haven’t really advertised my skills, but now I find myself freelancing in design. It’s a lot tough. Yesterday I went to get a guest pass at the local Gold’s Gym, and I am not that pleased. The work rooms are a little dark and depressing. I don’t want it to be frou frou pretty, but it looks depressing. AND I don’t know how to work some of the more scary looking machines. The machines I have worked with managed to be pretty self explanatory / I had someone to show me. These machines here, I have no idea how to use. I end up wandering around the place looking confused, lost, and little. I hate how you have to agree to a personal training session to get anyone there to show you anything. However, I am curious about the classes and I want to start using machines. : T I need something more aggressive than just running and cardio to keep the bulge off. I am feeling a little frustrated these days. I am keeping really busy, but I don’t think the things I produce during the day are that meaningful to anyone but me. That doesn’t feel good.